Of the many high capacity geysers out there in the market the Activa Amazon 5 Star 25L water heater geyser is one of the best. It is suitable for everyone especially for those who are in a hurry. The material used in the geyser is top notch which can last a few years. It has an anti-vacuum system automatic thermostat extra heavy heating element also comes with magnesium anode for longer tank life. The product is sold with a warranty of 2 years on the tank and 1 year on electrical components. You can easily avail similar products on. # Capacity # The capacity of Activa Amazon 5 Star 25L water heater geyser is 25 L which is an important feature of the appliance. This feature signifies that as the geyser is able to heat sufficient water in a short span of time it will save a lot of time of the users specially who are in a hurry because the geyser takes only a few minutes to make the warm water ready. Due to the efficiency the equipment is able to save a lot of energy. Thus this device is very useful and economic appliance in the bathroom. # Heating # The 2000 watt heating capacity of the geyser heats the water in a matter of few minutes. Moreover this device helps to prevent chances of accidents. With the rapid heating capacity this device is able to fulfil all the needs of the user regarding warm water. This high-quality geyser comes with a temperature meter for knowing the temperature of the water. # Tank coating # As water is heated in the tank chance of fast rusting is there to prevent the appliance from rusting it is coated with rust proof chemical which increases the life of the equipment. This efficient water heater has magnesium anode which acts as a sacrificial material for corrosive metals in hard water. # Preset thermal cut-out # An automatic thermal cut-out system is provided with the Activa Amazon 5 Star 25L water heater which is to reduce overheating. # Water pressure protection # A water pressure protection is fitted with the appliance which saves this powerful geyser from damage due to high water pressure and helps to maintain the pressure despite the height of installation. The geyser can work fine in a 4 Storey building and not more. 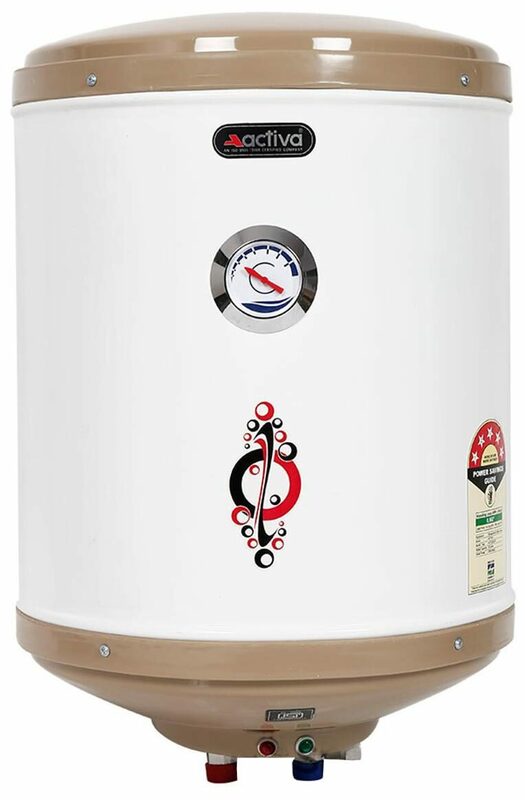 # Heat retention # Activa Amazon 5 Star 25L water heater is coated with heat retaining coating. This prevents the heat loss when water is saved up or retained in the water heater. It has a sheet metal body with plastic top and bottom. # Warranty # The Activa Amazon 5 Star 25L water heater comes with 1-year manufacturer warranty on all electrical components and 2 years warranty on the water tank. This durable geyser comes with ISI certification which means the product has gone through strict quality checks. # The images represent actual product though color of the image and product may slightly differ.